Style a Feed from Another Blog. ~ The Blog Doctor. You are here: Home > RSS > Style a Feed from Another Blog. Style a Feed from Another Blog. New Visitor? Like what you read? Then please subscribe to my Blog Feed or sign up for Free Email Updates. Thanks for Visiting! You can add content from another blog to your sidebar using RSS feeds. This is better than adding a Feed Widget to the blog. Using this method enables you to add a customized amount of your post also. A Feed Widget adds only post titles. Like this article? Subscribe to the RSS feed! What have you to say? 5 VIEWERS CLICKED HERE TO COMMENT ON THIS POST. ADD YOUR COMMENT. EMail this post to a friend? Skip to top of post. Buy Vin a Beer :-) if you liked this post. This is a very good tip, but I doubt that many bloggers will be able to implement your advice because, let's face it, they'd need at least basic knowledge of html. Widgets make it easy for everyone to add more information to a blog. Maybe it would be better that you follow up the entry with a short how to tutorial? Add Content with RSS feeds. Hei ... How to Upgrade my page Rank ?? Well, it does help for blogger blogs. I was not talking about me though. I work pretty good with both blogger and wordpress. I meant your readers. Maybe it is better to include the links in your entry? Btw, I forgot to mention last time how much I enjoy this blog. I think you do a great job teaching people how to use the tricky blogspot. Who is talking about the above post? Please use the above search box to search this blog before posting your valuable comments. Tips On Blogger and Latest News. 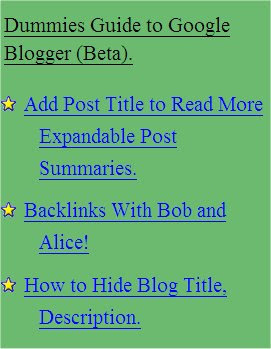 The Widgets of Beta Blogger. Making money with google adsense, Blogging & SEO. Join the Blog Doctor Community. How To Add Adsense Ads. Fluid Width Three Column Template Rounders Three Column Template. Cool Blue Web 2.0 Three Column Template Fluid Width Three Column Template.